Roots & Little Wings: Noah is 5 months! Sitting like a big boy! Playing with his toes! This month has been very exciting for Noah. The tooth fairy came to visit him this month and brought not just 1 tooth but 2 teeth (within 2 days of each other...yikes!). Noah was not the happiest camper when they were both trying to cut through, but once they popped up a bit, he was so proud of his pearly whites. Hylands homeopathic teething tablets provided lots of relief for him too (highly recommend these and you can get them at any grocery store!). He's been giving lots of open mouth smiles now to show everyone his new teeth!! It appears that a third tooth might be about to make an appearance soon....we are starting to see a little speck of white coming through next to his bottom right tooth. I thought his 2 top teeth would be next, but it is not appearing that way. I will keep you updated! Noah also started sitting solo this month. He is "tripod" sitting (placing his arms in front of him to help balance him). He is still a bit wobbly, but is having so much fun practicing! He did get his first shiner on his forehead while practicing this week. But thanks to a little bit of ice and some Arnica, a homeopathic cream to help reduce bruising and pain, his shiner was gone by the next morning. I would highly recommend every mom having some Arnica too(you can get it at Whole Foods and most health food stores). It also works wonders on his leg(s) after vaccinations! Noah met Santa Claus this week at Lenox Square Mall. 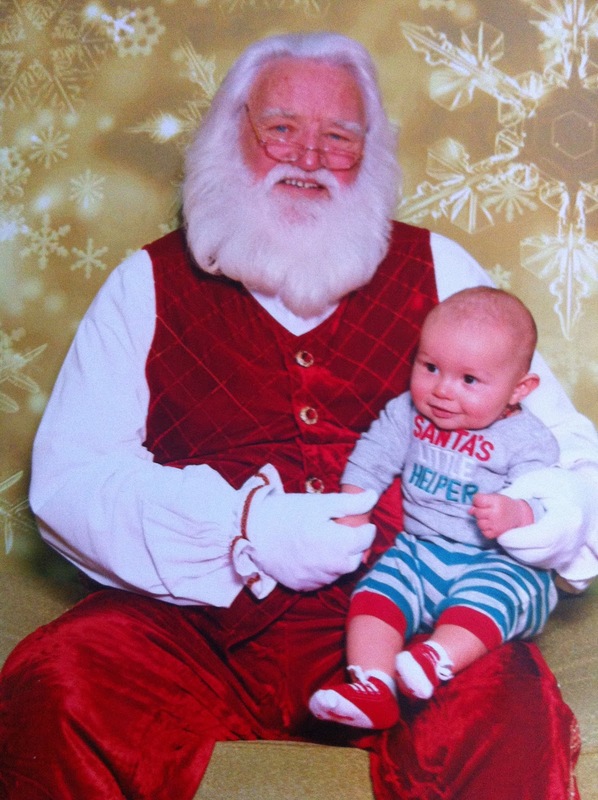 Much to our surprise, Noah LOVED Santa!! 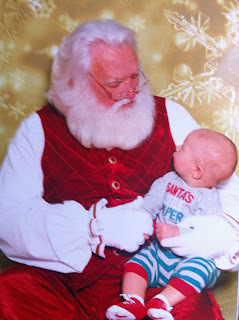 We thought for sure that our shy, sensitive boy would be a bit weary of Santa and cry, but he was the complete opposite. He was so fascinated by him and was so happy! Enjoy the photos below. We are planning on starting Noah on some solid foods this week, so I will be posting about that soon! I am so excited to start making his food! What darling pictures of the little man! 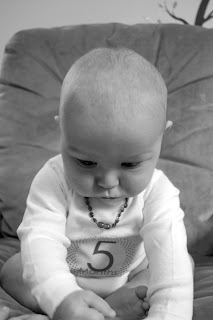 Can't believe he is already 5 months. It is so wonderful to hear about his "likes" and "dislikes". I really enjoy the blog!!! 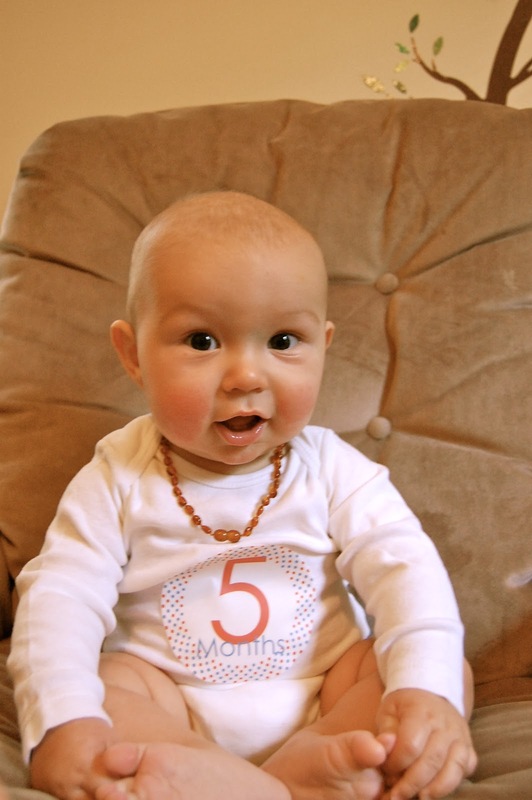 Happy 5 month, Noah! I just love these pictures - Enjoy your toes and teeth, Noah! Love to all.